Chhath Puja is dedicated to Sun God or Lord Surya and his wife known as "Chhathi Maiya" or Goddess Usha. Lord Surya is the deity worshipped during four days of Chhath Puja and the Sun God and his wife Usha are thanked for providing life on earth. 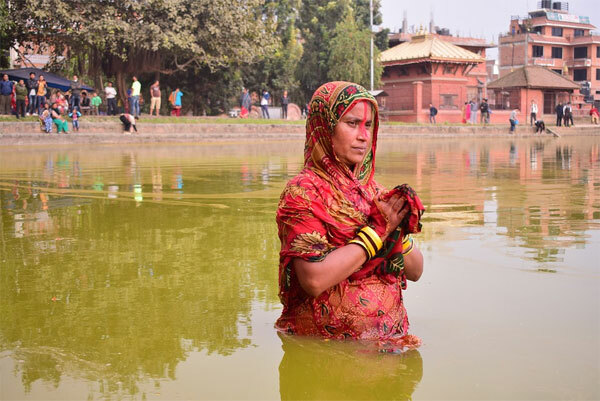 Chhath Puja occurs the sixth day after Diwali and the fasting is mainly observed in the states of Bihar, Jharkhand, UP and also Nepal by women folks for the well-being of sons and the happiness of the family. The main day to perform Chhath Puja is Kartika Shukla Shashthi, which is the sixth day of the Kartik month. First day of Chhath Puja is known as Nahay Khay in which only a single meal is taken by women observers. A dip in the holy waters especially in river Ganga takes place on this day. Women folks who observe Chhath take only single meal on this day. Second day of Chhath is known as Kharna. Women fast on this day from sunrise to sunset without water. After offering food to the Sun God at sunset, the fast is broken. Third day fasting in chatth puja starts after having Prasad on the second day. The prasad offerings include kheer, thekua, rice laddu and other things. On the third main day of Chhath Puja, a full day fast without water is observed. Arghya is offered to Sun in the evening. This is the main ritual and the only day of the year when Arghya is offered to the Sun in the evening. 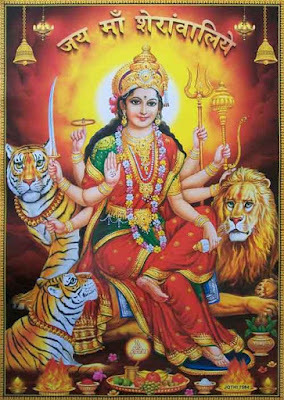 The third day Chatth Puja fasting continues for the whole night. Parana is done on the next day after sunrise. Arghya is offered to the rising Sun and it is known as Usha Arghya on the fourth and final day of Chhath. The 36 hours long fast is thus completed. Chhath Puja is also known by the names of Pratihar, Dala Chhath, Chhathi and Surya Shashthi. Why it is called Chhath? The word Chhath means "six" as this festival is celebrated on the sixth day of the month of Karthika. It is believed that Chhath Puja was celebrated by Draupadi and the Pandavas of Hastinapur during ancient times to solve their problems and regain their lost kingdom. Rig Veda mantras are chanted while worshipping the sun. 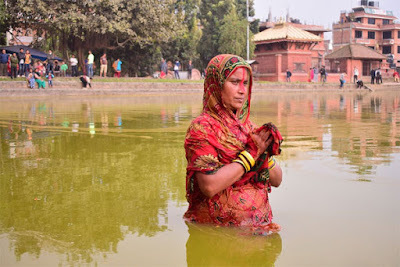 It is believed that Chhath Puja was first started during Mahabharata times by Surya Putra Karna who ruled over the Anga Desh (which is now Bhagalpur in Bihar).